Most of us are already acutely aware of the need to recycle and improve our personal and national carbon footprints, but with so many essential household items being contained within packaging that is either non recyclable or non-biodegradable it can seem like an uphill struggle. When I heard about Ecover’s ‘Message In Our Bottle’ campaign I was more than happy to support it. Ecover is already a name I associate with environmentally friendly and ethical products, so taking their campaign further with the aim of producing fully sustainable and recyclable plastic is truly commendable. Ecover have also produced this brilliant and informative infographic, to add it to your own webpage and further promote this wonderful initiative click here. Save the Children’s Race against Hunger Campaign. Recently many news outlets have focused on the problem of food waste, apparently nearly half of the food grown and produced in the world is wasted, amazingly this is about 2 billion tonnes. An incredible 30% of fruit and vegetables grown in this country does not even arrive at the shops because it doesn’t look ‘right’ and British households throw away on average between 30-50% of the food we buy. This information really struck home as Abi and myself at Angel Eden had already decided to make a jigsaw piece to be part of an installation organised by the Craftivist Collective in support of Save the Children’s Race against Hunger Campaign. The Craftivist Collective are asking people to make a jigsaw piece out of fabric and then embroider some words on it that will make yourself and others think about the problem of children dying of hunger. A staggering 300 children die every hour of every day! They also suggest that you make 2 more pieces, one to keep as a constant reminder of the problem and one to send to your MP. Everything you need can be found at the Craftivists Collective website. 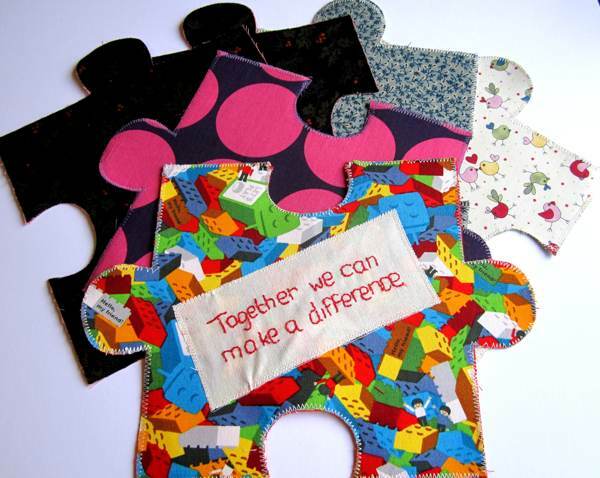 The completed jigsaw pieces are to be sent to the Craftivists Collective before the end of February and will be put together for an installation to be used at the time of the next G8 conference which Britain will host in June this year. 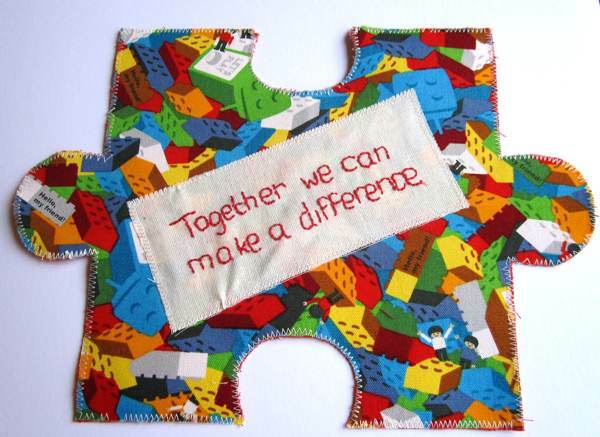 As well as making our own jigsaw pieces we are organising a couple of group meets to make more. They will both be on Tuesday January 29th. The first is with a group of friends at someones house and the second is at a meet of Derby Makers in the evening. Anyone in the Derby area is very welcome to come to the evening which will be held at The Silk mill Museum Derby from 7.00-9.00. Please contact me (anne@angeleden.co.uk) if you would like any further details. Comments Off on Save the Children’s Race against Hunger Campaign.